According to this article from CNBC says that only 39% of Americans have enough savings to cover a $1,000 emergency. Gulp. That’s a bit scary, isn’t it? Please don’t be part of the 61% of people that can’t cover a $1,000 emergency. Saving money should be a priority. I’m sure you have some questions like – How how do you even start saving? How much do you save? I think a good starting point is $1,000. This should be enough to cover some co-pay at the doctor or dentist, or a small car repair. A good tool you can use to help you start saving is a money saving challenge. There are tons of money challenges to fit any budget, and you can easily customize one you find to fit your particular situation. Give one of these savings challenges a try! Let me know if you’ve ever tried doing a savings challenge before, and/or if you’re doing a savings challenge this year! This saving challenge from Smart School House is an easy one that you can start any day of the year. All you need to start off is one penny! Every day you add a penny to the daily savings goal. So day one you save a penny, day two you save two pennies, etc. After 365 days of saving your pennies, you’d end up with $667.95! Since it just uses pennies this is an easy savings challenge to do with your kids or teens, or if you have a lower income. Find more about this challenge at Smart School House. This next saving challenge is from Fabulessly Frugal, and it’s another easy one that you can start on any day of the year. This is also a savings challenge you can keep doing for as long as you want. All you have to do is save every $5 bill that you come across! Super easy, right? I’m sure you’re wondering how much you can save with this money saving challenge. Well, it all depends on how many $5 bills you end up with, and how diligent you are about saving each one. According to the blog 1000 Life Hacks, there’s was someone that had saved over $3,300 using this $5 money saving challenge! This money saving challenge comes from He and She Eat Clean, and it’s another one that you can start on any day of the year. This particular saving challenge is a shorter one, only 6 months long! This particular saving challenge is super short – only three (yes, 3!) months long. There are also two different ways you can do this challenge! You can either save $200 a month for three months, or you can save $50 a week for twelve (12!) weeks. Either way, you’ll end up with $600! That’s a nice starting point for an emergency fund, or maybe a weekend trip? It’s all up to you! This next money saving challenge comes from one of my favorite personal finance websites, Fitnancials. This is one that you start in January, so you have plenty of time to get ready before this one starts! 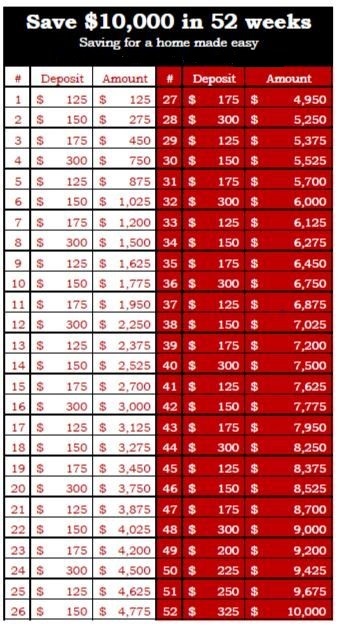 For this challenge, you save a certain amount each month, and at the end of the challenge you will have saved up $1000! That’s the perfect amount of a starter emergency fund! This money saving challenge comes from Mint Notion, and it’s another one that you can start on any day of the year. If you want to save up $1000 pretty quickly then give this savings challenge a try. This particular savings challenge is kind of the one that started it all and has been around for 5+ YEARS, that’s right, its an oldie, but a great one for beginners. There are many charts, graphs, and printables for this particular challenge, but I think the prettiest one can be found on Fresh and Organized. 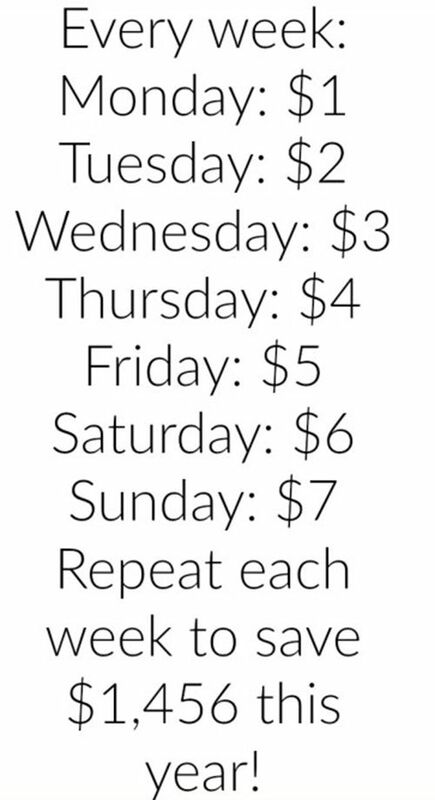 This challenge is similar to the Penny Saving Challenge, you add one for every week. But for this challenge, you start with $1 and then add one each week and save that amount. For example, week one you save $1, week two you save $2, etc. At the end of this challenge, you will have saved up $1,378! Not too shabby! If weekly savings isn’t your thing, or you’d just like some variety in your savings challenge, then this next one is for you! It comes from the Gurl Pinterest page. This savings challenge has you save something every day of the week for 52 weeks. At the end of the week you will have saved up $1,456! Just repeat this pattern every week to do the challenge! Easy peasy! If you’re feeling a bit ambitious, and want to save a larger amount over the next year, then this next savings challenge is for you! This saving challenge is from Gathering Dreams. It does require you to save some money every week, but at the end of it you should have over $5,000 saved up! This particular savings challenge might be a bit of a stretch, some weeks you need to save $155! Here are some things you can do to make extra money to help you reach your savings goals! 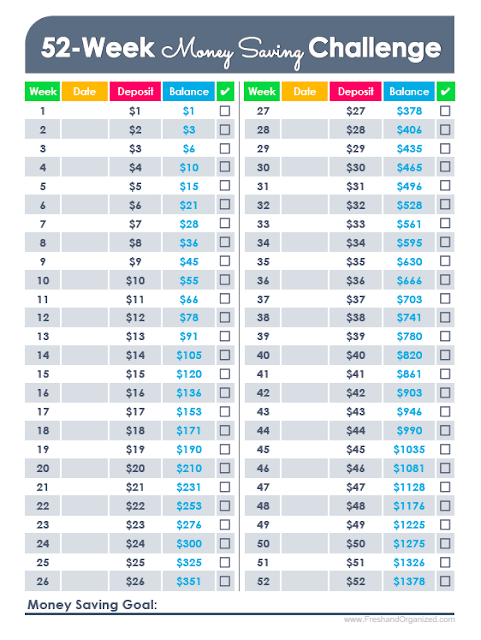 The biggest / most ambitious savings challenge on this list comes from The Stingy Saver, and it’s one that you can start any week of the year. This particular challenge is for saving up for a down payment for a home, but you can always use the money for anything you want! Emergency fund, trip, or a new car! So there you have it! 10 Savings challenges that you can use to help save up for your next big money goals. Will you be using any of these? Know of any other savings challenges? Would you like me to find more for you?